As promised, we are sharing some tasty ways to prepare wonderful Okra. Most people don’t care for it all that much because it can get a bit slimy…I happen to love Okra in every way, slimy or not. This dish is brought to you by Henry, who wanted to be the first in the line up of demystifying Okra. Now place Fat and Green Onions in large pan or wok, once onion starts browning add garlic, spices, peppers,and pork belly and cook for about 5 minutes on medium – high heat. Add Ground Beef and cook for another 5 minutes making sure all ingredients are well combined. Now add Okra and mix well, and cook for 5 minutes, cover, reduce heat to medium low and cook for additional 15 minutes or until Okra is at desired tenderness (Soft but not mushy). It is best if served with a side of fresh lime to squeeze onto dish at table side. We served it with oven baked Asparagus. Enjoy – there is more to come in the Okra series. Tried this recipe. Was not too happy with it. I added mustard seed for taste with the onion. 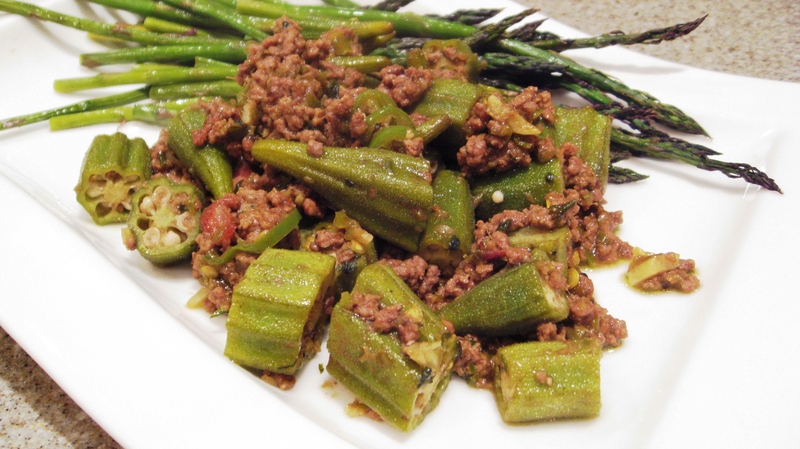 The ground beef absorbs all the flavor rather than okra. Hi Kevin, what was it in particular that you didn’t like? How did the mustard seed fair for you? I thought this was VERY tasty! 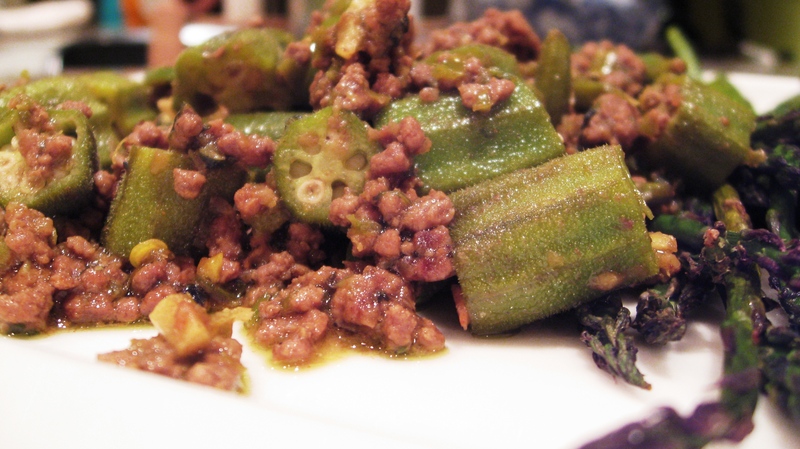 I was looking for something to make with our okra we had, and some ground wild pork I happened to have. It was so good!!! Just the right amount of flavor and spice. I honestly wouldn’t add more to it that I can think of! I tasted it at the :15 minute low mark and it tasted bland but let it sit for another :15 until my husband came home and it was perfectly tasty and the okra was a great texture.